Clearly, your decision is already made. You are going to buy that fancy cup of coffee and you will file away your guilt and enjoy it thoroughly. But what if you could recreate the café experience at home, saving a bit of cash and becoming something of a coffee connoisseur in the process? With this in mind I met with Sean English, co-founder of Unity Sourcing & Roasting, to walk through a few simple ways to up my coffee-brewing game. Unity aims to encourage consumers to not only deepen their understanding of where coffee comes from, but also to realize that “good” coffee can be accessible to anyone and made in many different ways. Sean and I holed up in his Astoria apartment on a chilly morning to play around with three apartment-friendly methods for brewing a satisfactory cup. At the beginning of our conversation, Sean asserted that there’s no one-size-fits-all formula for making the perfect cup of coffee. Sorry to disappoint, but he made a solid argument: coffee preferences are extremely subjective. Some people believe that an iced sugar-free caramel macchiato from Starbucks is the crowning achievement of the industry. Some are addicted to bodega coffee; others can’t stand it. Professional standards do exist, but it’s up to you to decide what you like and how you like it — “Different strokes for different folks,” in Sean’s words. When you make coffee at home, you have the power to control parameters and try new things. A grinder. Buying whole instead of pre-ground beans gives you flexibility to play with flavor, intensity, and brew method. To grind whole beans with ease and speed, Sean recommends an electric over a hand grinder, but both work. It might be worthwhile to invest in a model like this Baratza one, or you can opt for an affordable hand grinder by Hario. If you care to evaluate the merits of flat burr versus conical grinders, see here. A hot water kettle. You’re going to have to pour hot water into a brewing vessel, which is easiest using a stovetop or electric kettle. In addition to the roast, sometimes a bag of coffee lists its level of acidity. I avoid acid because of the connotation of the word, but Sean debunked my misconception. “It’s the type of acidity that matters,” he said. “Does it taste fruity and vibrant like a sugary orange? Or is it like I’m eating straight lemon peel? Sourness can have to do with how you brew or how fine the grounds are, not just the acidity of the beans.” Moral of the story: experiment and you shall discover. 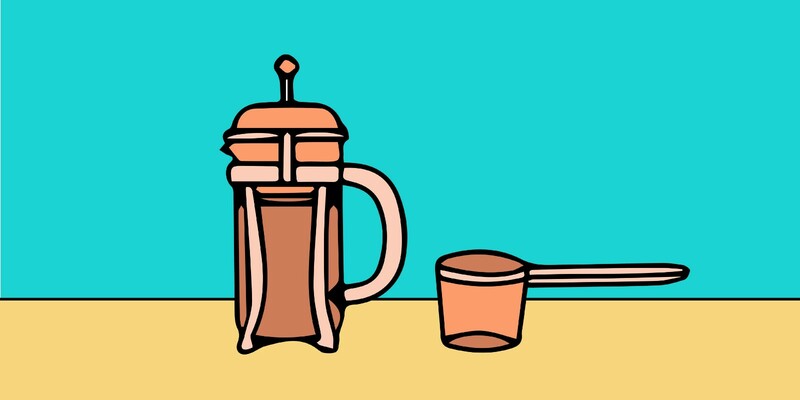 We reviewed three techniques, from simple to modestly complex: french press, pour over, and AeroPress. Each method offers a different level of control and entails its own process of “extraction,” which is what happens when you pour hot water over grounds — the water draws out the flavor and caffeine. This is a basic method that allows you to retain more control over the outcome than you would with a Keurig or drip machine. Sean uses a Bodum french press, which can be found at almost any grocery store or home goods retailer. Water: coffee ratio: Sean’s french press makes about two cups of coffee and comes with its own scoop. Each scoop holds about 0.25 ounces or seven grams of coffee, and Sean uses six. Rather unscientifically, he pours hot water in until the grounds reach the metal bar at the top of the press. Then he stirs and lets it sit for about a minute before putting the plunger in. Brew time: Sean typically waits four minutes before pressing the plunger all the way to the bottom of the vessel. “No need to be exact, but staying within about five minutes is best to avoid an over- or under-extraction,” he said. Sean uses a Chemex, calling it his “go-to brewing method”. They come in a variety of models and sizes, but Sean’s makes about two large cups. This method requires a filter for the extraction process — you can buy recycled paper and cloth filters, or even better, grab an eco-friendly stainless steel one. 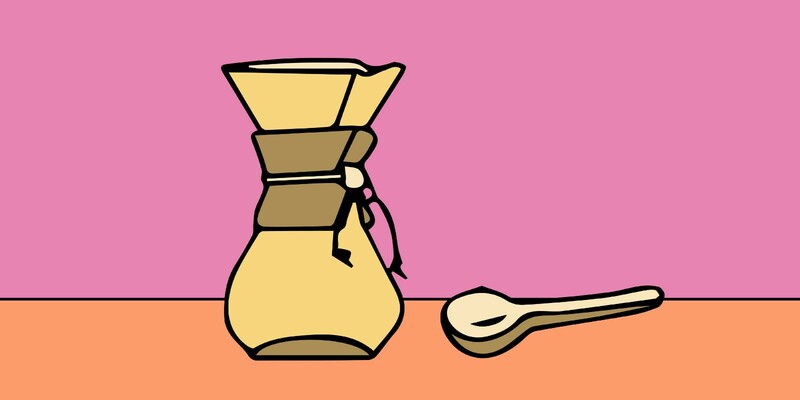 Grind: Your grounds should be medium coarse (a bit less coarse than the french press). Water: coffee ratio: Sean uses the about same amount of coffee for his pour over as as he does for the french press. However, you can decrease if you don’t want a dense flavor, or add extra for more richness. Pour the water gradually in a circular motion to ensure equal saturation. Pro tip: Sean pours some water through his filter before adding grounds to get it wet and heat the carafe. He then transfers the water into his mug to warm it up — a simple step that boosts the experience. Brew time: This factor isn’t as relevant for a pour over, but Sean uses a timer to see how long the extraction takes and how it varies day by day. Just for fun! The AeroPress mechanism essentially creates a vacuum chamber for the grounds and water. It creates a pressurized extraction, which is why it’s super fast and you can make espresso-esque drinks with it. Science! Grind: For a cheater espresso, use a very fine grind — “almost like beach sand.” Sean uses the finest setting possible on his electric grinder. 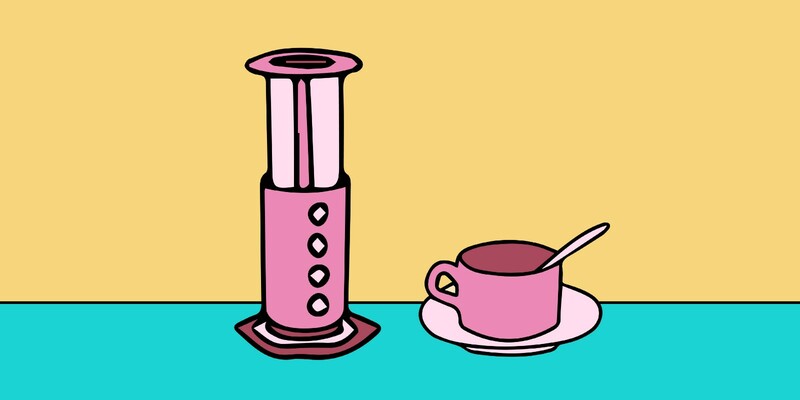 Water: coffee ratio: The AeroPress comes with a few proprietary tools, including a paddle for stirring and a scoop. For his espresso, Sean uses two of these scoops of coffee. He then pours hot water in until it’s halfway between the 1 and 2 markings on the AeroPress, amounting to about two ounces of coffee (a double espresso). For a full cup, you’d fill the vessel all the way. Once the water is in he stirs the top to break up the grounds and inserts the plunger. I walked away from my morning with Sean both highly caffeinated and highly enlightened. If you glean one thing from this article, it should be that making coffee at home can bring you just as much joy as buying it at a coffee shop — just takes a few extra steps and an open mind. Do you have coffee making tips to share? Let us know on Facebook, Instagram, or Twitter! All illustrations by Chumi Gonzalez.